Children often follow in their parents’ footsteps. For example, many children root for the same teams and like the same foods as their parents. But do they enter the same professions? Over the past year, teacher strikes have brought to national attention the plight of teachers across the country. Teacher shortages and a lack of teacher diversity are major issues facing schools right now. Recent evidence shows that teacher shortages exist and are expected to worsen. So where do new teachers come from? Many come from existing teachers—that is, they inherit the teaching profession from their mothers. Using nationally representative surveys of the cohorts that graduated high school in the late 1970s and early 1980s, we show that compared to other children, the children of teachers are more than twice as likely to become teachers themselves. This is true for the sons and daughters of white teachers and for the daughters of black teachers; the heritability of teaching is even stronger for the daughters of Hispanic teachers. The sons of black teachers are the only group who do not seem to follow in their mother’s professional footsteps. Teachers are important and effective teachers are in relatively short supply. Yet it is difficult to identify effective teachers a priori, as many observable qualifications, at best, only loosely predict effectiveness. A striking exception is teacher race—specifically the race match between students and teachers—which boosts a plethora of student outcomes such as attendance [and here], behavior, achievement, and even high school graduation and college enrollment. This has led to a concerted, and growing, effort to recruit and retain more teachers of color and to diversify the teacher workforce so that it becomes more representative of the students they teach. One possibility is that, at least in the case of teachers, children follow in their parents’ professional footsteps. If so, it is unsurprising that the majority of teachers continue to be white, as white teachers tend to have white children. We pursue this intergenerational story in a new IZA discussion paper. Using data from the nationally representative National Longitudinal Survey of Youth 1979 (NLSY-79) we show that teaching is indeed transmitted from mother to child, and that this transmission occurs at greater rates than for other similar professions such as social work, counseling, and nursing. Moreover, the transmission of teaching occurs at roughly equal rates for the sons and daughters of white teachers and the daughters of black teachers; interestingly, there is no such transmission for the sons of black teachers. Overall, children whose mothers were teachers were nine percentage points, or 110%, more likely to become teachers than the children of mothers who were not teachers. Limited data on fathers’ occupation suggest a similar transmission of teaching from fathers to sons, but not to daughters. The figure below reports the effect of a child’s mother being a teacher on the child’s likelihood of entering teaching. These effects are relative to the baseline teaching rates of the children of nonteachers, which is 8%. Here we can only speculate, but we can rule out some simple explanations by leveraging the rich data collected in the NLSY-79 survey: It is not due to the socioeconomic or demographic background of teachers, nor is it due to ability or educational differences between teachers and nonteachers. 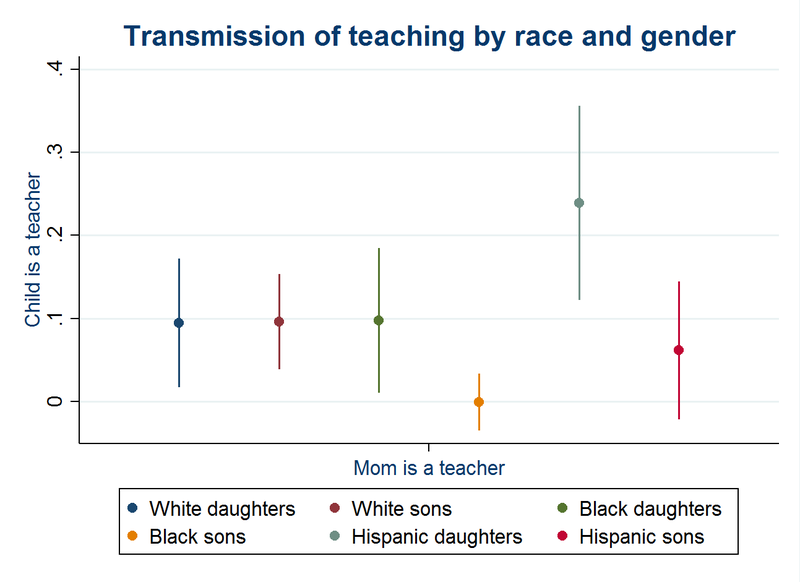 Another possibility is that the transmission of teaching is due to parental pressure to follow in the mother’s footsteps; however, this too is unlikely, as we see similar transmission rates for both sons and daughters of white teachers and that the transmission of teaching is actually weaker for single than married mothers. Still, much remains to be learned about who enters teaching, and why. It would be fruitful for future research to investigate the channels through which this sort of intergenerational transmission occurs, as it has important implications for the recruitment of a diverse teaching force and more generally for understanding who enters teaching, and why. Similarly, it is unclear whether teachers who entered the profession due to parental influences are more or less effective than teachers who entered the field for other reasons. This, too, merits consideration, as providing all students with access to effective teachers is paramount to providing equal opportunity to all. Families with multiple generations of teachers are neither rare nor quirky oddities: 44% of teachers were themselves the children of teachers. Schools, districts, and colleges of education should take note of this understudied, under-realized fact. The authors thank Michael Hansen and Jon Valant for their feedback on this post.